If you’re looking to upgrade your living room this year, a floor lamp is a great way to do so without spending a fortune on redecorating. Our focus today is on showcasing a broad cross-section of styles from traditional lamps through to more directional and utilitarian lighting for more modern homes. We tested around 30 floor lamps and curated this into a list of just 15 so we give you plenty of options without confusing you. If you want a more traditional lamp but you also want something that will slot into your smart home, this Alexa-enabled floor lamp from industry legend Brightech delivers fully on both counts. You’ll need a smart outlet but these are not expensive and you’ll also need a device like Echo Show or Apple HomePod in order to use voice commands. Alongside this classic appearance, you’ll be able to use energy-efficient LEDs so you can slash your utility bills while still getting all the light you need in your living room. 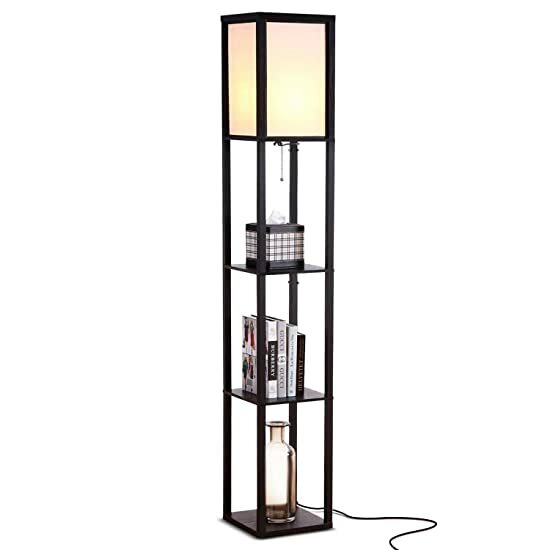 New meets old in the best possible way with the Brightech Montage LED floor lamp so what are you waiting for? Slip this into your living room this year and start turning your lights off using nothing but your voice if you want to invest in that hard-hitting smart home tech to complement your lamp. If not, you’ll get a straight-up lighting solution from a brand you can rely on backed with a fantastic guarantee so it’s a win-win from Brightech. 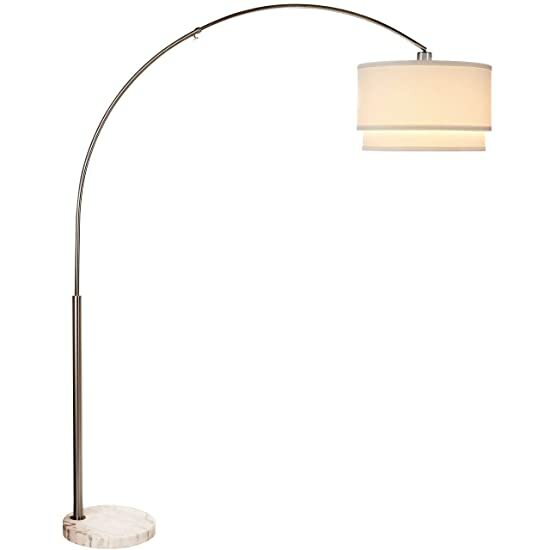 A worthy runner-up in our quest for your living room is this modern art deco-inspired lamp from Stone & Beam. While you’ll get a tall, multipurpose lamp, the Stone & Beam occupies a fairly compact footprint so works just as well in a smaller apartment as a sprawling house. Overall measurements are 59 ½ x 18 x 18 inches. The base is rugged and the four-legged design gives you plenty of stability, perfect if you’ve got kids running around the house. The monochrome looks sees a subtle linen shade set against stark black metal legs so you’ll feel like you’re being thrown back a century while the design will fit seamlessly with most décor. This lamp will look equally at home in a minimalist loft conversion or a traditional and more cluttered living room. Cleaning is a cinch and all you’ll need is a soft, dry cloth. Great value anyway, you’ll even get an energy-efficient LED bulb thrown in so what are you waiting for? 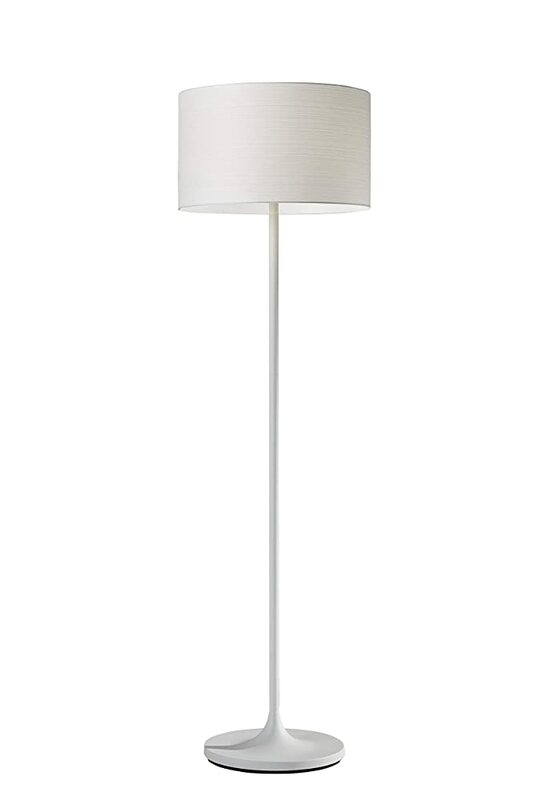 Our pick for best budget floor lamp is another Brightech beauty, this time the Emma. A three-legged LED, you’ll not only get a great bargain but can also save money month in and month out thanks to the energy-efficient bulb. Good for 20,000 hours of use, the 9 ½-watt power-saving bulb comes included. One of the key fashions for interior design this year is the use of natural materials and this lamp managed to be bang on-trend without looking over the top. The wooden base complements the off-white shade perfectly. If you’ve got an automated home and want to use a voice assistant to control your smart outlets, all you’ll need is the outlet and requisite device. Whether you prefer Alexa, Google Assistant or Siri, you can hit the lights without needing to get up off the couch. Perhaps the best part is the robust 3-year satisfaction guarantee removing any jitters from purchase. Next up we’ve got another Brightech floor lamp, as usual packing an efficient LED bulb built to last and to save you money on your power bills at the same time. Choose from multiple colorways from black through brushed nickel ensuring the best possible fit with your existing décor. If you’ve got a busy household and kids prone to tugging on fixtures and fittings, you’ll appreciate the remarkable stability offered by this lamp. The cool-touch design means your children won’t end up with scorched pinkies either so Brightech has the safety angle fully covered. One design seldom fits all with lamps so you can opt for one of five colors and match your floor lamp with the design of your living room. If you fancy something a little more retro, this antique-style aged brass floor lamp from Aaron is the obvious solution. Fully 64 inches high, it’s also slimline with a 10-inch base narrow not to eat up too much precious room in your living room but stable enough your lamp won’t come crashing to the floor. You’ll have a choice of bulbs so you can roll with what works best for you. 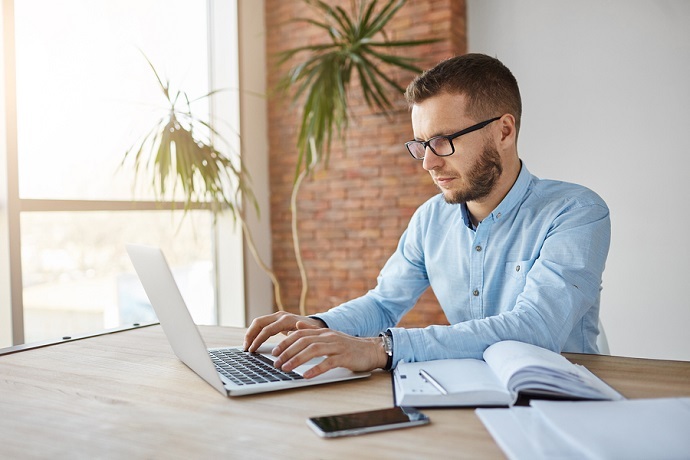 We’d strongly recommend considering LEDs since they’re extremely energy-efficient while offering bright light essential for reading or working. The trio of lights in place makes this lighting ideal for reading or working so if you’re looking for something special for the home office or the kids’ bedrooms, why not treat yourself? 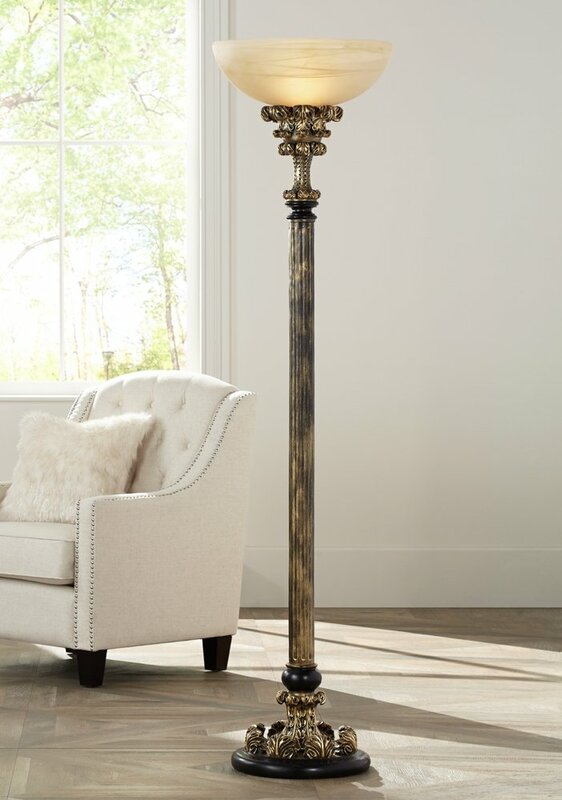 Looking like something from the Roman era, this ornate torchiere-styled floor lamp from Florencio is a conversation piece but that design comes at a pretty stiff price. If you’ve got a more fluid budget and you appreciate the finer things in life, though, this antique gold effect lamp from Barnes and Ivy adds a splash of luxe to any living room. You’ll get the best of both worlds with enough light to fill even a larger space along with the ability to dim it back when you want a more muted ambiance. To prevent all that golden metal from becoming overpowering, it’s offset by black accenting and topped off with an amber shade. 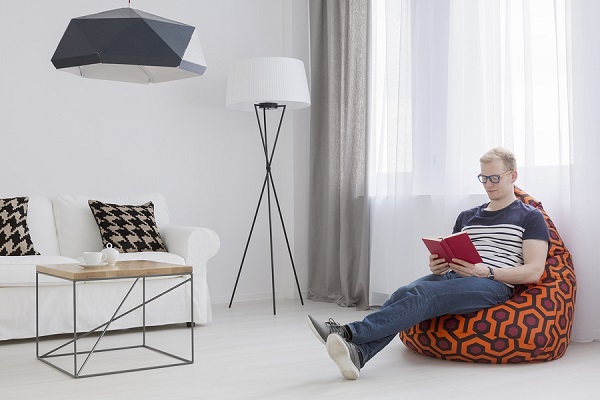 While this is by no means the cheapest floor lamp you can add to the living room, you’ll get plenty of bang for your buck from a brand you can trust. We’ll kick off with a negative this time and make it clear that a few disgruntled customers have fed back that this floor lamp doesn’t last the distance. 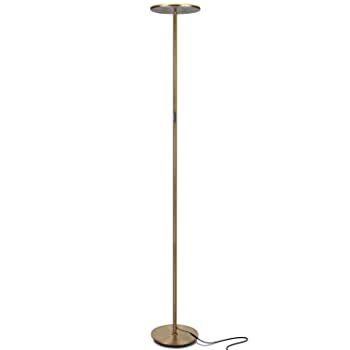 We haven’t had the opportunity to conduct long-term testing so all we can say is that far more consumers have nothing but a shower of praise for this floor lamp. You’ll get ample scope when controlling the 3 lights. You can opt for one side only illuminated, the left and center only or have all of them beaming at once if you need plenty of light on the subject. With this model, you won’t be able to use LED bulbs but you can opt for CFLs or the more traditional incandescent bulbs according to your preference. The Trinity model we tested is more low-slung with the alternative Bowery reaching up a little further while still boasting the same great looks. 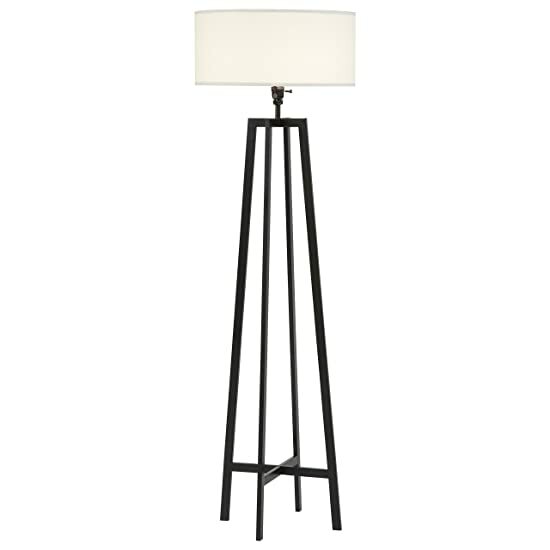 Whichever you opt for, this floor lamp should set off your living room a treat. Next up in our floor lamps for living room reviews is yet another model from the highly reputable Brightech in the form of this LED arc model named Mason. With most products, we focus on a selection of different brands but at the same time we prize bringing you nothing but the best. With floor lamps, there’s simply no escaping the stranglehold Brightech exerts so we’ve chosen many models from their impressive range not through bias but because they’re so good. If you need to pop a floor lamp behind the sofa or in a corner, the compact and streamlined design of the Mason makes this a breeze. That said, the arresting design wouldn’t look out of place in a more substantial living room either. 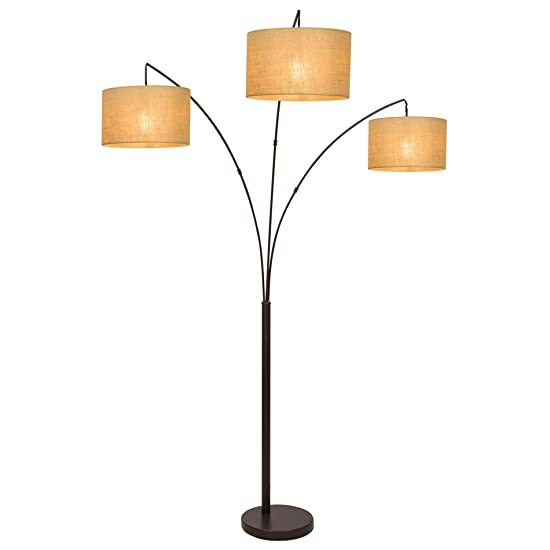 This is certainly not the cheapest floor lamp for your living room but it’s absolutely one of the very best. If you want a modern classic with plenty of smarts and the capacity to take energy-saving LEDs, you can’t go wrong with the Brightech Mason. 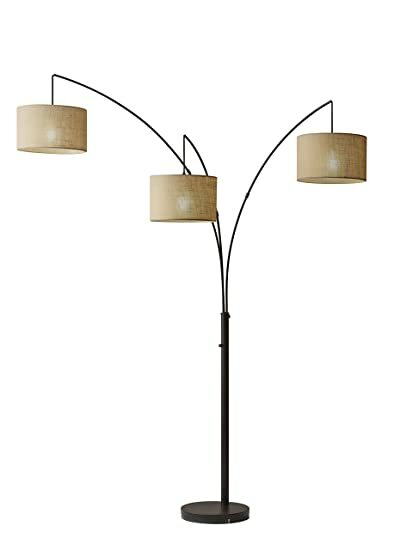 Coming in nickel and two varieties of bronze (antique and oil-rubbed), this 3-light floor lamp has a sweeping appearance to set off any living room and the versatility of a multi-lamp solution complete with dimming functionality. Definitely not cheap, this is nevertheless a lamp with build quality uppermost and a guarantee to match. Should you need it, you’ll find customer service prompt to respond and extremely helpful. Compatible with timers and smart plugs, the Revel slots neatly into any automated home giving you the advantages of cutting-edge tech married to a clean and classic design suited to more traditional homes. UL-listed for safety and capable of accommodating CFLs, LEDs or incandescent bulbs, you’re spoiled for choice with this powerful floor lamp for your living room from a brand you can trust. As we edge toward the end of our best floor lamp for living room reviews, we’ve got yet another offering from Brightech with the Eclipse. If you’re looking for something completely different, this dual-ringed lamp certainly hits the mark. It looks more like something from a sci-fi set than a traditional lamp so we’d suggest this is something for those with more utilitarian and minimalist tastes than someone looking for a regular floor lamp. You’ll either love or hate the design so if you’re a fan, what else does the Eclipse have besides looks? Well, you’ll get all the brightness you need when you want plenty of light on the subject coupled with the ability to dim it right back if you’re settling in for the evening with a movie. Making use of LED bulbs (and, as with all Brightech lamps, a bulb comes included), you can get energy-efficient lighting without compromising appearance. For a unique and highly effective floor lamp for your living room, the Eclipse will do anything but leave you in the dark! 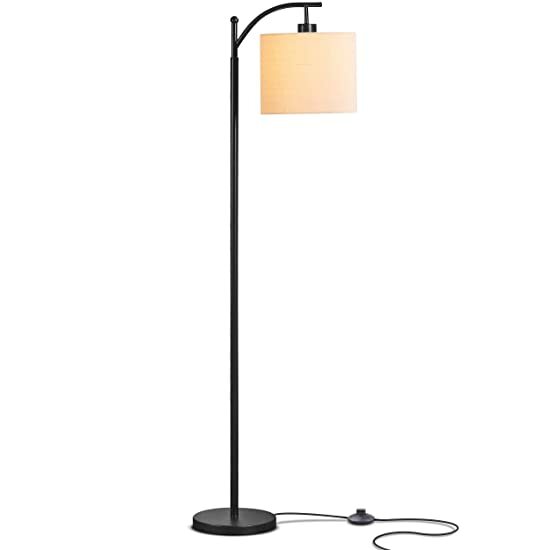 No list of the best floor lamps for living rooms would be complete without a cameo from Ikea, the Scandinavian furniture maestro. 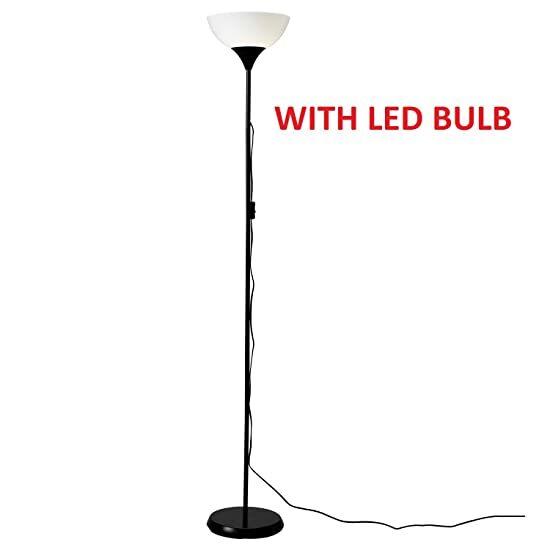 You might think an LED floor lamp that’s such a hit in the looks department would cause you to dig deep but the Ikea NOT is a pocket-friendly model and demands almost nothing by the way of care except a quick dust off with a soft cloth. Packing a bright and energy-efficient LED, you’ll get all the light you need without a stiff power bill to pay. The only real downside with this budget floor lamp is a cord that would be better off if it was cut a little closer. The excess spoils the minimalist aesthetic somewhat although we certainly wouldn’t class this minor gripe as a deal-breaker. If you fancy a floor lamp with arched styling so you’ve got overhanging lighting when you want to curl up with a good book, the Brightech Logan is yet another home run from this lamp specialist. You’ll get the usual smart home integration if you’ve got smart outlets and a device equipped with a digital assistant. Controlling your lights with voice commands offers a wonderful extra layer of convenience and this is one of the key factors that differentiates Brightech from much of the opposition. The metal stem contrasts delightfully with the marbled base and you’ll get a combination of pioneering technology, energy-efficiency and a traditional design that will fit neatly into just about any living room. 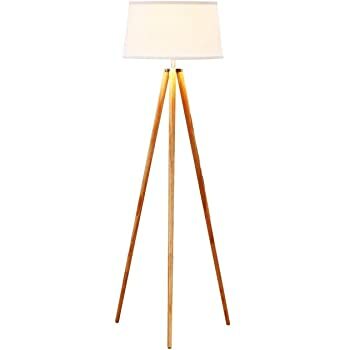 Aside from being slightly tasky to put together and a relatively fragile feel, this is a great and multi-functional floor lamp well worth the money. 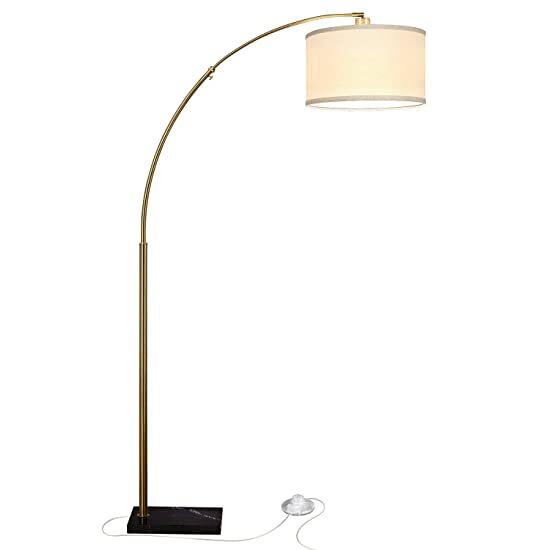 Next up in our quest for the best floor lamps is our final model from Brightech. As you can clearly see, they’ve dominated today’s selection and that’s entirely on merit. We have no bias toward any particular brand as we mentioned but we simply couldn’t help bring you multiple models from this stellar manufacturer who do lights like few other companies on the market. You’ll get the voice assistant smarts and the rock-solid warranty you’d expect from Brightech but with this model you won’t be able to dim it down. 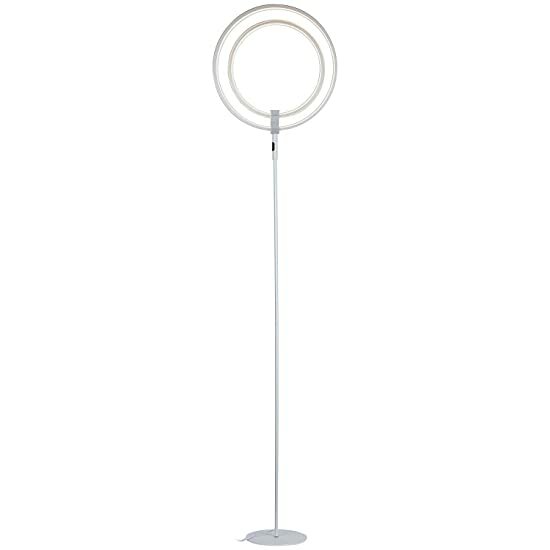 The telescopic arc renders this lamp particularly suitable for reading or crafting and it occupies fairly little space making it perfect if you’ve got a smaller living room. We feel duty-bound to point out that a number of users have complained about defective products out the box with some parts bent out of shape. We certainly didn’t experience this but we’d advise looking closely at the package before throwing away the box. This lamp comes in a number of shapes and configurations with each model having a different layout for the storage that comes in exceptionally handy if you’ve got a smaller living room and plenty of knick-knacks to display. 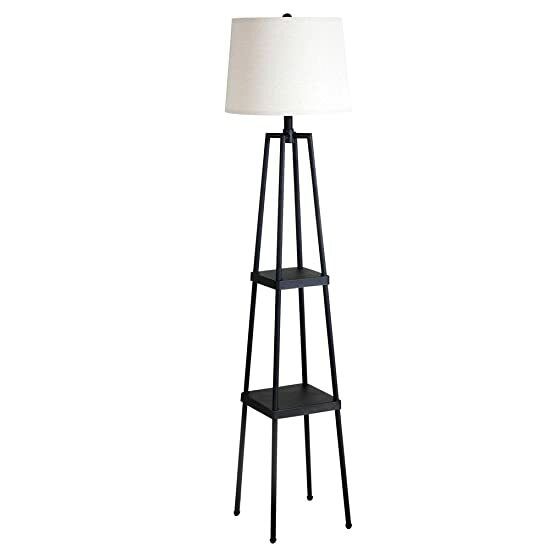 The contrasting monochrome means this floor lamp would work with a more traditional living room layout or with as stripped-down minimalist aesthetic. It’s a versatile lamp in terms of looks as well as storage. You can use a regular 100-watt bulb or opt for an LED if you prefer, again giving you the freedom you want in one adaptable floor lamp. Rounding out our reviews, we’ve got another Adesso in the shape of the classic Oslo. Attention to detail extends from the ornate base through to the Japanese paper lending a patterned look to your room when the lights are blazing. 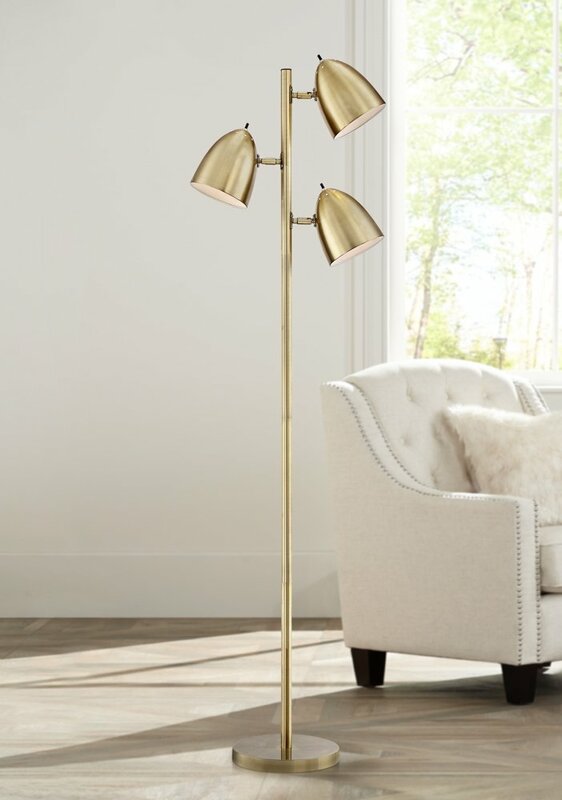 Whether you want to sit around chatting or curl up with your favorite book, you’ll always have plenty of light on the subject with this floor lamp installed. You can go for an incandescent bulb (100-watt) or a CFL (20-watt) but you won’t get any included so make provision for this in advance. As with most of the best floor lamps, this model is designed to take up little space without sacrificing performance so whether you want something for a smaller living room or a conversation piece for a more substantial lounge, the Adesso Oslo is well worth popping on your shortlist. With our floor lamps for your living room reviews nailed, it’s time to round out with a brief look at how to buy one the easy way. Choosing a product as simple as a floor lamp might seem like the easiest buying decision you ever faced. As soon as you’re confronted with the thousands of models glutting the market, though, you’ll see that’s far from the truth! Also, while floor lamps might not be complicated, there are a few key elements to consider that will streamline your decision and make choosing one a piece of cake. Height of Ceilings In Your Living Room: If you fancy a lamp that seems to extend ever-upward, this is not much use if you’ve got low ceilings. Equally, if you’re lucky enough to have those high ceilings that increase the illusion of space, you can afford to get a little more adventurous when you’re buying a floor lamp. Size does matter so take it into account! With any luck, you’re now crystal clear about which floor lamp for living room would make the best fit for your tastes and budget. We aimed to bring in something for everyone and we hope we didn’t disappoint! We’ll be stepping back into the kitchen next with a look at some combination air fryers and then we’ll be back into the living room again with a look at the best sofas. Come back soon as we’re always taking delivery of new products, rigorously testing them then reporting back with our findings. We want to make your life easier every step of the way so bookmark this page, follow us on social media and get in touch if you have any queries or feedback at all.